We have worms crawling on the WEB! Well, not really, but you can read about Vermicomposting in the classroom. Our first grade class is concerned about the earth. 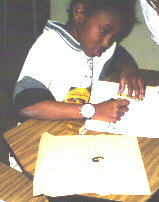 We want to help our planet by reducing the garbage created at school. One way to reduce trash is to recycle. Another way is to help compost biodegradable material. 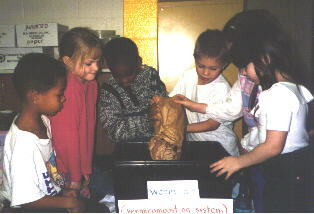 In our first grade class at Delmar Elementary in Delmar, MD we are vermicomposting. In the classroom we keep a bin with dirt, newspaper, and worms. (red- wigglers to be specific). After lunch we collect our leftover biodegradable food and bury it in our worm bin. Each day we check the worms and we can see that they are turning our leftovers into good soil. This spring we will put the soil and worms in a small graden that we planted last spring. (This was started to prevent soil erosion and runoff, but that's a different story.) 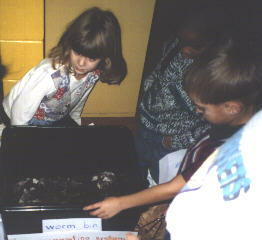 The children enjoy learning about worms and everyone loves how we are helping the earth! Our Worms are skinny. They crawl. How do they climb under dirt? They eat the food and the food turns into soil again. We have a garden outside and we will put the worms in the garden. Worms can get fat. If we don't want something to eat we give it to them and they eat it in the box. We put bread and apple cores in their box. Mrs. Crouse put her coffee grinds in it, We don't have to feed them everyday. How do worms wiggle and how do they eat food? We feed them our left over lunch. compost box. Some of the worms got out of the box. They died. Our worms eat food that we put in the compost box. Some worms came out of the box and they died. We will put them in the garden when they get bigger.